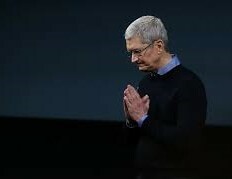 Tim Cook has had to start his year by sending an open letter to Apple's investors, telling them the company's revenues for the first fiscal quarter of 2019 had been revised downwards. Cook noted that this decision had been influenced by factors such as the increased strength of the US dollar and reduced iPhone revenues. However, the letter also also highlighted areas in which Apple performed well in 2018. The CEO of Apple, Tim Cook, has issued a letter to Apple's investors to inform them of a change in the company's guidance for its own earnings and gross margin. These figures apply to the first quarter of fiscal 2019. For Apple, this quarter actually ended on December 29, 2018. Cook's new figure for the relevant revenue is US$84 billion, whereas the revised gross margin is 38%. Both of these numbers may sound positive; however, Cook's original estimate from about 60 days ago now was that Apple could earn as much as $93 billion in the quarter. Therefore, considering the scale of the business in question, the newly reduced gross-margin projection (which was initially thought to be closer to 38.5%) is potentially substantial. The CEO cited "macroeconomic" factors in the rationale behind this revision. These included the strength of the US dollar, in addition to "challenges" in emerging markets such as those in Asia. Furthermore, Cook conceded that the revenue from iPhone sales was lower than anticipated. On the other hand, Cook also stressed that Apple showed considerable strengths in other areas (particularly in its cash assets: the company is now sitting on about $130 billion). He also pointed out that the number of its devices in active use worldwide is now greater than ever before, and had grown by approximately 100 million in 2018. Nevertheless, the relatively poor earnings performance has depressed Apple's share price by about 8% recently, and may have had a knock-on effect on other tech stocks.